A key to reducing air conditioning costs during hot summer days is to limit the amount of heat generated within the home or apartment during the afternoon, when temperatures are at their highest. Try to wash and dry clothes, iron and cook in the morning or later in the evening. Use microwave ovens, which produce much less heat than stoves for cooking. Use awnings, curtains, or blinds to keep out direct sunlight. This will keep your house cooler. One of the most inexpensive and effective ways to reduce your air conditioning costs is to adjust your thermostat setting. The savings can be significant when you set your thermostat at 78 degrees Fahrenheit or higher. For each degree you raise your thermostat setting, you reduce seasonal cooling costs by 6 to 8 percent. Setting the temperature a little higher of around 78-80 degrees Fahrenheit , will you save 6 to 8 percent of your cooling costs for each degree above 78, and most people will be comfortable. Use a ceiling fan or portable fan to supplement your air conditioning. A fan can make you feel three to four degrees cooler (and only costs a half-cent per hour to operate) so you can set your thermostat a few degrees higher and save on cooling costs. Use in occupied rooms since fans cool people, not rooms. Turn off the air conditioning or set the thermostat up a few degrees when you leave home. Be sure your air conditioner is not blocked. 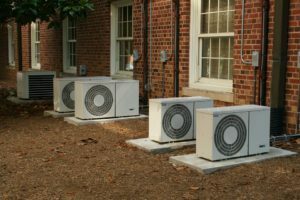 A free flowing air conditioner operates most efficiently Be sure the return air grill inside your house is not blocked by furniture or other items. Filters should be checked monthly. When air conditioning is on, keep doors and windows closed Turn off kitchen or bathroom exhaust fans when your air conditioning is operating. Shade your home from direct sunlight. Use shades, drapes, awnings, trees and shrubs to block the hot sun from heating up your home. If your air conditioning equipment is older and less efficient, compensate by being extra careful about temperature settings, hours of operation and filter condition. During the cold winter season, Houston and surrounding areas households will consume a lot of energy to heat. Our winters here in Houston don’t leave us the luxury of letting our heating systems stay down. It is better to implement proactive measures for Houston heating service, maintenance, tune ups and inspections. If you have a general comfort level working around mechanical equipment these tips will be right for you! However, it is recommended to hire a licensed professional to diagnose and locate any problems your heating system. Whatever type of heating system, don’t wait until it heating system breaks down to call for service. A clean, well-adjusted heating system will save you money on energy bills. Servicing your system is called many names by heating contractors: heating service, heating maintenance, heating tune up, heating inspections, to name a few. Remember having a seasonal maintenance agreement for heating and cooling by a licensed HVAC contractor will keep your heating system in good working condition. For a complete list of services and offers, call Houston Admiral Air Conditioning and Heating 281-876-9400 or visit our website https://goadmiral.com. We are always open!